I was cleaning up my phone’s gallery a few days ago. 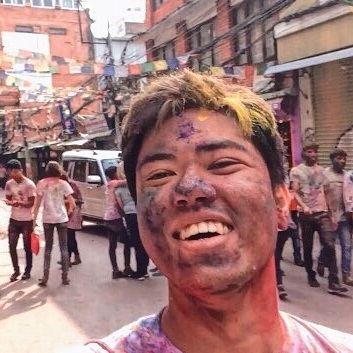 After over five minutes of scrolling, I came upon a huge pile of photos dated February and March 2018, mostly containing snow-capped mountains, temples and my face covered in colourful Holi powders. All of which I haven’t had the chance to organise until now. It occurred to me, it’s been nearly a year since my three-week solo trip to Nepal, one of the most beautiful yet underrated countries for Filipinos. Nepal was the first country outside of East and Southeast Asia that I’ve travelled to. Similarly, it was my first time to fly more than five hours on a one-way connecting flight from Manila, and be around locals who, for once, don’t look like me. The trip was truly special in many ways, which is probably why I’ve kept most of the details to myself and a few close friends for many months. To those of you who don’t know, Nepal is located just below Tibet and surrounded everywhere else by India. Its capital, Kathmandu, is far more different than any city in Asia, or at least in the countries I’ve been to. There are no skyscrapers, theme parks or high-end resorts. As I once told my friends, it was like being in an Asian version of Diagon Alley, that when I got home from the trip, it felt as though I just woke up from a dream, or walked straight out of a cinema. But regardless if you’re a fan of Harry Potter or not, you’ll find plenty of reasons to visit, and eventually fall in love, with Kathmandu, as well as the entire country of Nepal. Here are just some of them. In previous conversations with international travellers, I would often boast about the Philippines being the cheapest country for travelling. Even cheaper than “budget-friendly” countries like Thailand and Vietnam. That all changed when I went to Nepal. Can you imagine staying in a double room with a private bathroom and balcony for only ₱500 a night? The same price couldn’t even get me a clean dormitory bed with locker in many hostels I’ve stayed in Southeast Asia. 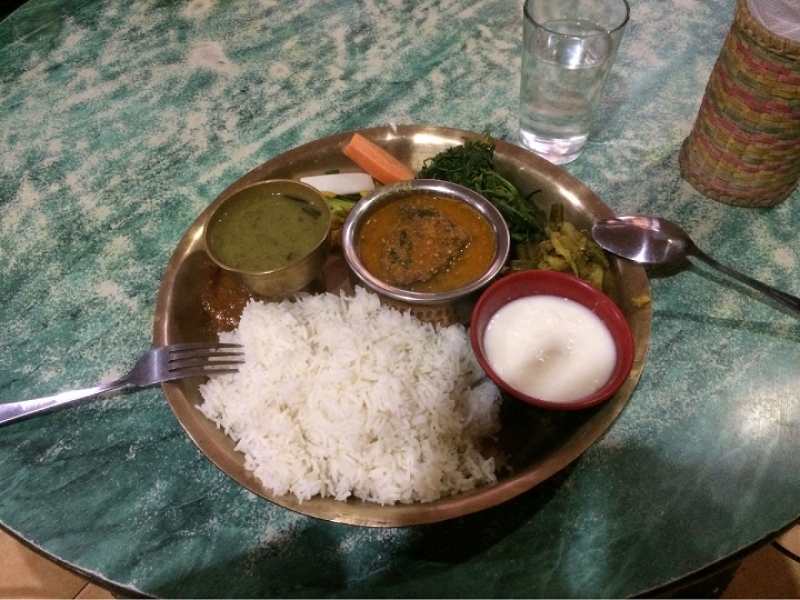 Dal bhat — a staple Nepalese meal of meat, soup, vegetables and rice. For about ₱200, I could eat a full meal consisting of at least three viands and unlimited serving of rice. Once, I ate a delicious steak dish in Kathmandu for less than ₱300! From books to clothes, shopping also proved to be quite inexpensive, even without bargaining with a local seller. And like in most countries, the prices only get lower the farther away you travel from the city. The only exception would be when you’re up in the mountains for a trekking trip, which is a different story on its own. Growing up in the Philippines, many of us, myself included, tend to gravitate towards the ocean for the weekend or a holiday leave. Anything that has water in it was my idea of beauty for over 20 years. But then I started looking for something else. In Nepal, there aren’t any beaches or oceans. Instead, there are alpine forests, rugged valleys and of course, the world’s tallest mountains. And they are all just as breathtaking in their own way. With four seasons, the country offers various sceneries even the most discerning travellers won’t help but look at. 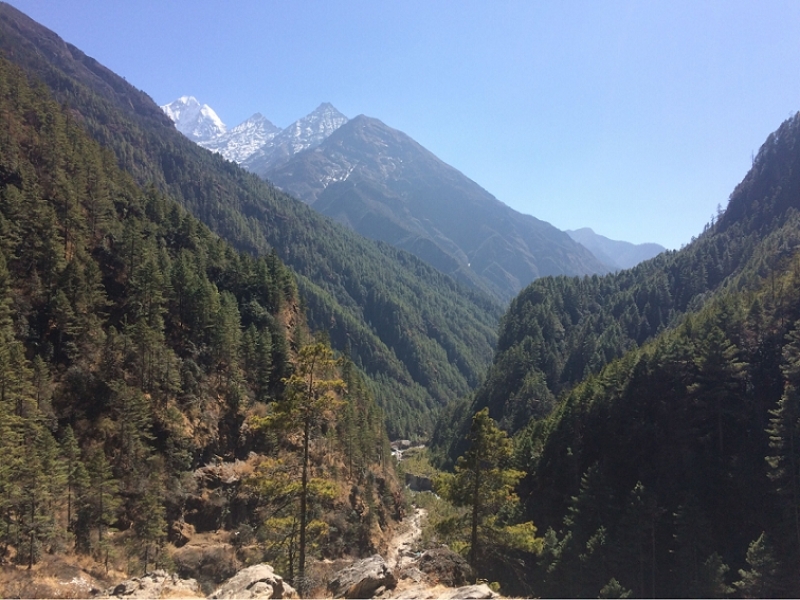 One of the many postcard-ready views during our Everest Base Camp Trek. In other areas, you’ll find high-altitude deserts dotted with sandstone cliffs resembling popular landscapes found in Jordan and Egypt. Only there are little to no tourists. Be warned though, some of these places are only reachable with a licensed guide, a dangerous flight or long hours of trekking. For instance, there are only two known ways of getting to the Everest region. One of which is by flying into the world’s most dangerous airport of Lukla. Looking at pictures of Nepal, you’d never realise that the country is just a few nations away from the Philippines. If you search early, you can score comparatively low year-round fares to the country, which can sometimes go down to ₱7,000 for a round-trip ticket. The most common and affordable way of flying here is via Kuala Lumpur. From Malaysia’s capital, it’s only another four-hour journey. Other popular options include Bangkok and Hong Kong, although prices are usually not as cheap. 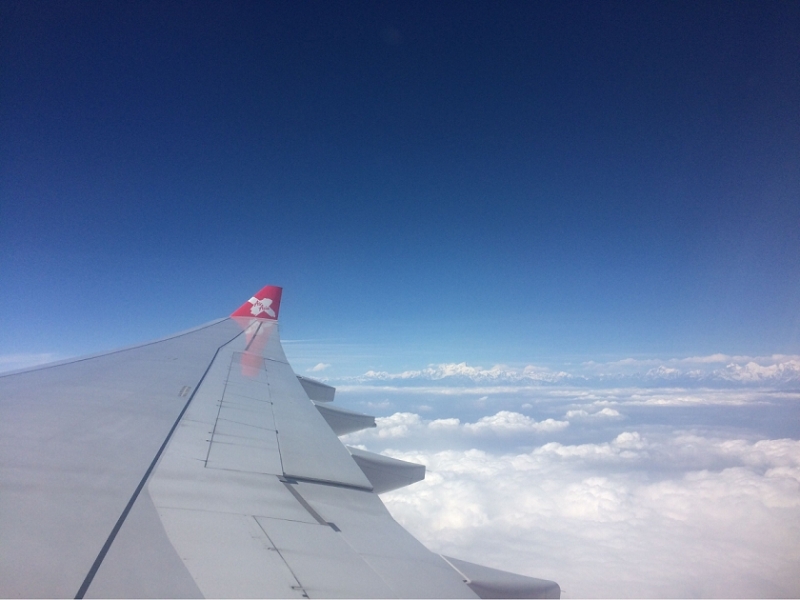 By the last few minutes of your flight, you’ll be greeted by the world’s most beautiful mountains from your window. In my case, I got more than a greeting. The traffic at Tribhuvan International Airport caused us to go around in circles (literally) in the air for almost an hour before we finally landed in Kathmandu. That meant a free sightseeing tour of the Himalayas for me! Moreover, Filipinos only need a visa-on-arrival for Nepal which starts from US$25 for a 15-day stay. I only had to type in my information on a machine in the immigration area and pay for the appropriate fee. Nepal is known as the ultimate backpacking or adventure destination, which also means only a relatively small number of travellers go here compared to most Asian countries. The streets of Kathmandu alone require serious navigational skills and an extra watchful eye for over speeding motorists. Posing with my Everest trekking buddies at 4,000+ metres above sea level. On the bright side, if you’re a certified adventure or nature lover, you’ll easily make new friends anywhere you go, especially during a trekking trip. (Tip: It’s best to book your land packages upon arriving in the capital city as they offer proven cheaper rates than what you’ll find online). Aside from trekking, you can also try bungee jumping, paragliding, skydiving and even going on a safari! I visited Nepal primarily for trekking. It wasn’t until I got back to the city from my Everest Base Camp Trek that I realised there was indeed more to this country than its mountains. Aside from Kathmandu being a UNESCO World Heritage Site in itself, Nepal also has a number of temples, palaces, stupas and monasteries that are largely preserved. 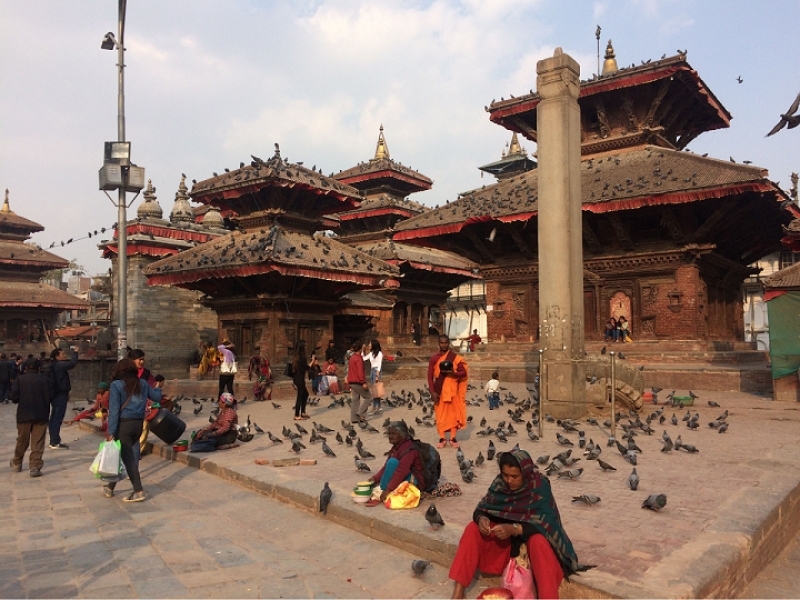 One such place I got to visit is the Kathmandu Durbar Square. Many of its buildings have been damaged and brought down by the 2015 earthquake in Nepal. Nonetheless, most of its areas remain open to visitors and you can still feel its old-world charm on your visit. Inside the Kathmandu Durbar Square. I also went to Pashupatinath Temple. Here, I witnessed a traditional Hindu open cremation ceremony first hand. I had to pay a not-so-small amount of Nepalese Rupees to enter the compound. In the beginning, I thought it was just for show — until I made it to the actual cremation site next to the Bagmati River. I must say, it was one of the most unforgettable, albeit hair-raising, moments of my Nepal trip. As others would say, travelling is sometimes about going out of your comfort zone. What better country to do it than Nepal? From reasonable buys to sensational nature and cultural experiences, the land of the Himalayas is certainly a place worth visiting.